Today, a bit of tool talk! 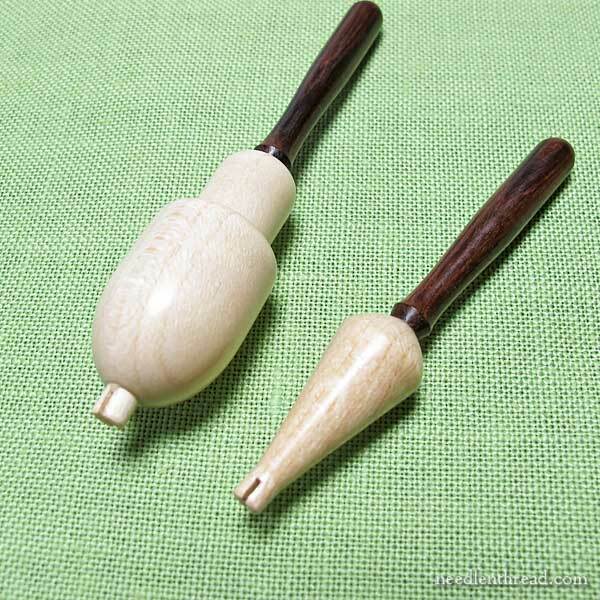 Are you familiar with half cone sticks and trumpet cones used in dimensional embroidery and needle lace making? Today, we’ll look at these curious little tools, which are also called “embroidery shoes,” and later on, we’ll explore how they’re used. We’ll also take a look at trumpet cones, which are used in a similar way to half cone sticks. Here’s my little set of half cone sticks. They’re from the UK, from Coleshill Collection, but they’re also available in other places, discussed below. As you can see, the tools are wood. They’re made up of handles with different shaped heads attached to the handles. Each head has two little holes in it. One side of the head shape is rounded, while the other side is flat, cut off at a slight angle. Trumpet cones are slightly different. They have a flat side, and they have a different shape altogether – they’re shaped (hence the name) like the open center “trumpets” found on various flowers, like daffodils for example. Here’s the whole set with a pen thrown in, to give you an idea of scale. You can see they’re not large tools at all! They’re little and lovely! What are Half Cone Sticks Used For? 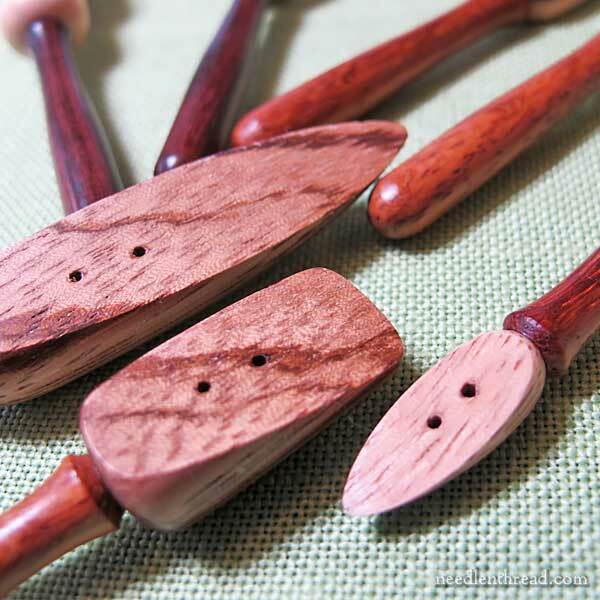 Half cone sticks (and trumpet cones) are used to aid the embroiderer in making consistent, open, shaped dimensional layers on embroidery or needle lace. Think of a shoe tree or form that’s used inside a real shoe, to keep its shape. The idea is somewhat the same. With the embroidery shoe (or half cone stick) tacked to the surface of the fabric, you stitch over it, to create an open, shaped area of embroidery stitches – and then the shoe is removed and the open shape remains. You’ll find the concept demonstrated on Janet Granger’s blog, where she used half cone sticks to embroider foxgloves on a project. The trumpet cones are used slightly differently – the embroidery can be done on the whole cone (no fabric involved) and then removed and applied to the fabric. Where Can You Find Half Cone Sticks? As mentioned above, I bought mine through Coleshill Collection (which now has a shop on Etsy) a while ago. They’re a UK based company, but the shipping was reasonable and quite fast. You can find them in other places, too, mostly in the UK. In Australia, you can find a small set (two) with a Hedebo ring gauge or stick from Alison Cole Embroidery. If you’re interested in ordering from him, you can contact him via email at brucebassett(at)gmail.com. He sometimes has some on hand, already made, and they’re $40 for a set of $5, with $8 for domestic shipping. If he doesn’t have them on hand, it can take a couple weeks to make them, depending on other obligations and whatnot. I think Bruce’s half cone sticks are flat on one side, without a cut angle to the cone, from what I can tell from the photos. So the shape of the resulting open cone would be slightly different, as the opening on the angled-cut cones would trumpet upwards a little differently. The advantage is that the handle isn’t sticking up away from the fabric, like it does on the angled-cut cones. But again, it depends on the shape you’re looking for. We’ll explore using half cone sticks and trumpet cones a little later. I’ve been working up some tutorials, so that you can see how to use these little tools for adding dimension to your own embroidery projects. 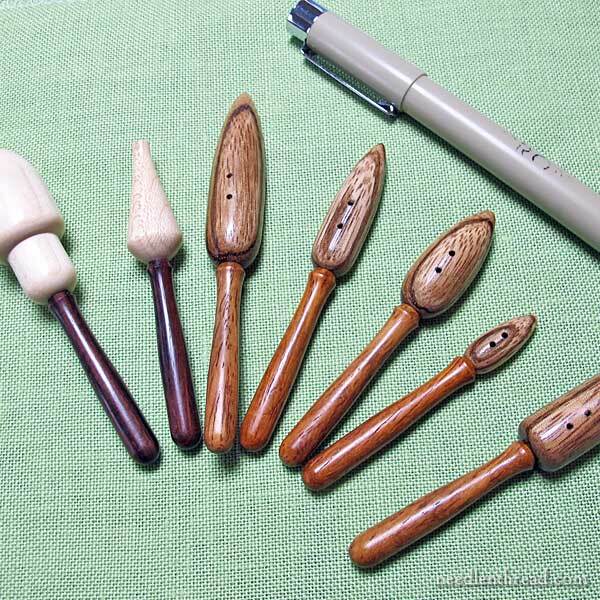 Have you used half cone sticks or trumpet cones for dimensional embroidery or needle lace? Any tips you want to share? Or projects you’ve used them on, that you’d like to share a link to? Or are you curious about the tools and have any questions? Feel free to join in the conversation below! I have one half cone stick which I received when I ordered my aficot from The Guild of Needle Laces which you wrote about in March. In the book Stumpwork Embroidery by Kay and Michael Dennis they show how to use the cones and I thought I would like to try the stumpwork foxglovesI shown in the book. I’m so glad you are going to do a tutorial using them as I thought I would like to try them and I can’t wait for your tutorials. Thanks for your review on the half cone sticks and the trumpet cones which I can’t wait for you to show how to use these. Mary, I was so elated to see this! I just purchased a set and need guidance on learning how to use them! Mine are also from the Coleshill Collection. What an interesting little tool! I will be anxiously be waiting to see your tutorials! Cone sticks are wonderful for shaping and blocking knitting when you’re stitching up stuffed animals and dolls, and for shaping wet felted pieces! Where have those little guys been all my life? I have used the little half ones without holes for stumpwork but how much better these would have been! Thank you so much as ever. I’m really intrigued by these. I had never heard of them. Can’t wait to see them in action. Under what circumstances would you use these items? is there a specific type of embroidery other than needle lace that they’re used for? Do you have photos of finished items that have used those tools? They are like darning eggs – and it’s almost the same concept! You’re just using them for shape, really. There’s a link in the article above, Gina, to Janet Granger’s blog, where she used them on foxgloves, and, as the end of the article mentions (under “what are they used for”) they’re used for dimensional embroidery. I’m working up a little tutorial project for them, and I’ll show you some examples when I post that. You didn’t mention where the trumpet cones came from. They are originally from Needle Paws (I was involved in the design process). If they were purchased from the Guild of Needle Laces, these too are made by Bob at Needle Paws. I believe they are slightly cheaper if you buy direct from the Needle Paws website. Hi, Allison – I bought the set and the trumpet cones from Coleshill Collection! OOOH! I have been wanting some of these to practice making a needlelace foxglove that I saw in a book on stumpwork. I didn’t actively go out looking for them (not knowing what they were called, but just seeing them in the book). Thank you for the source!!! Fascinating! I wasn’t familiar with these tools at all. Thanks for the link to Janet’s blog – I love miniatures, and her blog looks wonderful. The half cones made by Bruce Bassett look like they have no holes. Is it better to have the holes to attach to your fabric or without holes? I look forward to seeing more about this subject. They do have holes, Sandra – three on the larger ones and two on the smaller ones. I had a set without holes. You attach them by sewing around the “handle” to keep them attached to the material while you work. I find the 2 holed ones are more stable. I had never heard of these little gems let alone used one until now. Uh, Oh…another thing for my list of “wants”. Can’t wait for your tutorial. I enjoyed reading Janet’s blog too. Loving your daily posts. I feel like I’m sitting with you over a cup of coffee. Good morning Mary ~ I have been wanting a set of the half cones for a long time, just hadn’t made the investment. I went to the Coleshill Collection site, but not find them. After looking in the Needlework Accessories, not finding them, I put ‘half cone sticks’ in the search and again came up with nothing. Can you assist me in where they are on this website. I’m utterly fascinated as I was not aware of the existence of these tools. Thank you for the information and link. 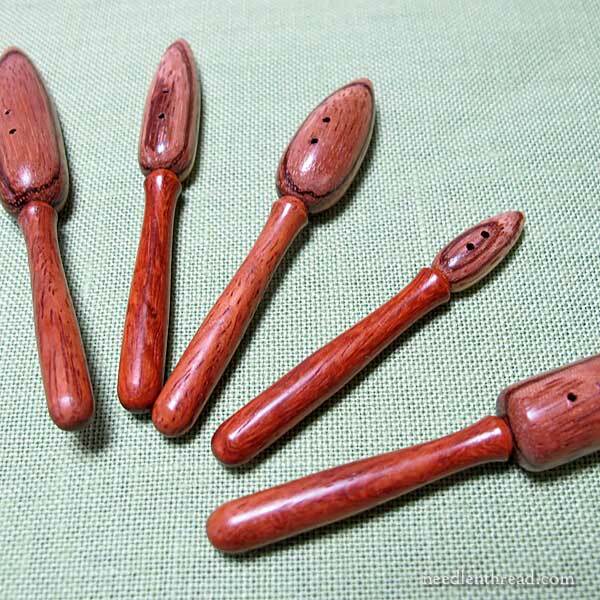 I actually have a set that he made, since the wood colors he was using didn’t match up, and he likes to make matching sets. I’ve never used them, but I should come up with a project to try them on. What an interesting post. I have bought from this company, and also from it’s sister company, Siesta Frames, several times when at the big London shows but I have never noticed these little gems. If I get to the October show at Ally Pally, I’ll ask about them if they haven’ t appeared on the websites by then. As I would certainly like a set. Looking forward to your tutorials. So fun to collect these wonders and try them out. Thanks for the inspiration. Hi Mary. I have been wanting to learn more about the shoes as well. I ordered a set from Coleshill Collection on April 24th but have not received them yet. It does take a while to receive mail from Europe. I can’t wait to read what you will be sharing with all of us. I received my beautiful set of Embroidery Shoes from Coleshill Collection. The quality is wonderful. I can’t wait to see what you might post on how to use them. The wait was well worth the quality and workmanship. Still my favourite stitching blog, the wonders never cease with you, Mary! Looking forward to the tutorials, and very grateful for the link to Janet Granger’s gorgeous blog. I have the Home Sweet Home book in my stash of ‘someday’ embroidery, and really look forward to devouring her post on her progress. Just read the ducky post too, and really appreciate the little lessons from a practice stitch before the ‘real thing’. Looking forward to the finished ducks! I bought some of Bruce Basset’s gorgeous little things but I haven’t actually used them yet. A tutorial from you will get me off the sofa, so to speak. BTW, I liked the idea of the afficot very much and now I have one. I was going to order one online but when I showed it to my husband he said he would make me one – and he did. It’s lovely, I wish I could include a photograph. My apologies for any offense caused – none was intended. 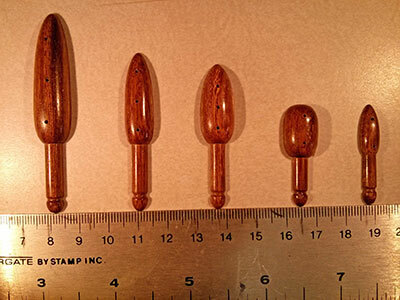 I have since spoken to Bob at Needle Paws, he has told me that he makes the trumpet cones for them too! I knew they were our design because there was nothing else like it available. I have successfully used a cone for making-guess what-daffodil trumpets! I also have a shoe which came with my cone. It’s shaped like a little Dutch wooden shoe. I have never known what it was called or what it can be used for. I would love to see a video of how to use the trumpet cones! Previous Previous post: Stitch Sampler Photo Sharing…and more!